Adam Opel AG, BMW AG, BMW M GmbH, BMW Motorsport GmbH, BMW Motorrad GmbH, BMW Japan, BMW Thailand, Daimler Chrysler AG, Irizar Autobuses España, MAN Truck & Bus AG, Mitsubishi-CSB Berlin GmbH, Suzuki Deutschland GmbH, Airbus S.A.S., Air Berlin, Augsburg Airways, Deutsche British Airways dba, Lufthansa CityLine, Lufthansa Technik AG, Etihad Airways, Gulfstream, Thomas Cook, Condor Flugdienst, Eurocopter Deutschland GmbH, Atlas Jet, Sunseeker, TUIfly, AirLivery, Galerie Kreo, TuiFly.com and much more. http://www.icelandair.us/hekla-aurora/ Watch a team of amazing artists paint an entire Icelandair plane into the beautiful northern lights. A world first, bringing the northern lights to an airport near you. Would you like to take an Icelandair Stopover? This livery is a part of our #MyStopover campaign. Etihad Airways' A340-600 aircraft has a 'dynamic' design with white at the nose leading to red at the end of the plane. The official F1 logo is featured on the engines and motor racing's famous 'chequered' flag is on the tail fin. The unique paintwork was performed at Airbus' A380 paint hangar in Hamburg, Germany. 60 Jahre Luftwaffe spiegeln sich im neuen Kleid des sonderlackierten Eurofighters wieder, dem modernsten Kampfjet der fliegenden Streitkraft. Lackiert in vier Tagen, zeigt sich die Maschine der Öffentlichkeit zum ersten Mal auf der Internationalen Luft und Raumfahrtausstellung (ILA) in Berlin. Video di presentazione della specialissima versione della KYMCO 250 GP "EVO" impegnata nella Moto3, nata dall'importante collaborazione tra KYMCO e l'azienda modenese Oral Engineering e allestita per l'occasione dal rinomato Maestro di arte moderna Walter Maurer. 60 Jahre Luftwaffe: Walter Maurer feiert mit! Die Deutsche Luftwaffe wird 2016 stolze 60 Jahre alt. 60 Jahre voller Veränderung, Spannung und großartiger Projekte, mit dem allgegenwärtigen Ziel, den Frieden in der Welt zu fördern. Genau aus diesem Grund feiert die Deutsche Luftwaffe ihren 60. Look up in the sky! It's big. It's blue. It's our new special livery plane Vatnajökull. Inspired by the largest glacier in Europe. Four airbrush artists, twenty-one assistants, 590 square meters of canvas and 195 liters of paint were used to create this aircraft - truly a sight worth seeing. For all those who were once allowed to watch him at work, he is the king of painters: Walter Maurer (76). For over 50 years he has been refining his art of lacquer watercolour - after all, it was him who founded this genre in the first place. Thanks to a special spraying technique, ingenious colour gradients and a lot of sure instinct, Maurer gives objects a new coat of paint - from the car door to the Boeing, from the Formula 1 racing car to the Eurofighter. Think big(ger)? No problem for Maurer! 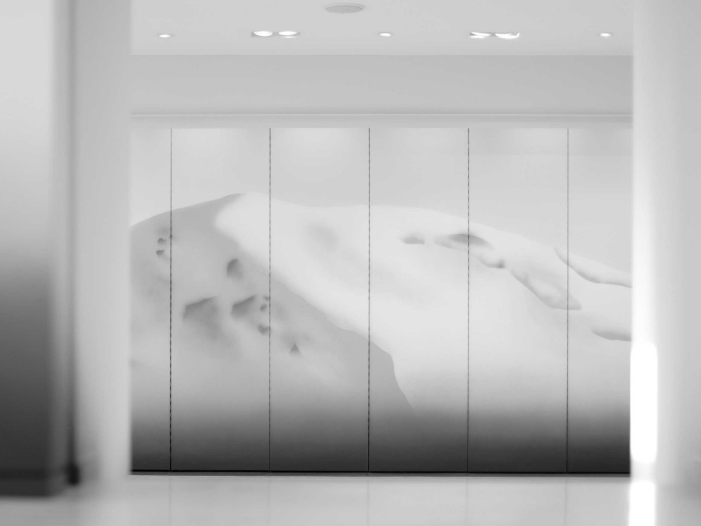 Now he is transforming the Munich flagship store into a walk-in work of art. Special thanks to Sami Ayadi and Jan Heinzelmann - for the great cooperation.